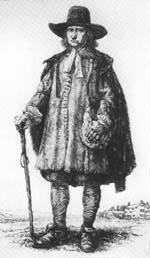 During the Puritan Revolution in England, George Fox (1624-1691), the founder of the Society of Friends, became dissatisfied with the ceremonials, creeds and practices of the existing churches. After growing up in a devout family, Fox left home at nineteen and wandered for several years like many other restless seekers, questioning his Bible, ministers, and anyone who would listen. But he remained unsatisfied. Finally, as he later recorded in his Journal: “when all my hopes in… all men were gone, so that I had nothing outwardly to help me, nor could tell what to do, Oh then, I heard a voice which said, ‘there is one, even Christ Jesus, that can speak to thy condition’, and when I heard it my heart did leap for joy.” The faith of John’s gospel he “knew experimentally” — that “the true light which enlightens every man was coming into the world” even in his day. To him this was a new revelation. Yet his finding reemphasized Luther’s priesthood of all believers, and drew unconsciously from the accumulated experience of saints and mystics. Although the Puritans also re-emphasized the power of the Holy Spirit in the hearts of people, Fox believed that his contemporaries were unwilling to trust the seed, which was another name he used for the indwelling light. He knew from experience, confirmed by intensive study of his Bible, that this Light or Spirit is the source of unity, joining the good in each of us to our neighbour’s good, and also identifying the evil revealed by hypocrisy. In supreme confidence, simplicity, and strength of youth, George Fox began in 1647 to “proclaim the day of the Lord” in the Midland counties near his Leicestershire home. He attracted a group of men and women who, once convinced that “Christ has come to teach his people himself”, joined the joyous work as publishers of truth or as friends of the truth, Children of the Light, or simply Friends. Perhaps they remembered John 15:12-17, where Jesus called his followers friends. The unconvinced, however, derisively called them Quakers, perhaps because they professed to tremble before the Lord or because of the actual physical effect of the over powering intensity of their message. To find the Light they felt the need for silence which continued in their meetings for worship except when someone felt the need to share the light that had broken forth. After five years Fox went to Northwestern England where he found whole congregations already meeting in silence without appointed ministers. He won the household of Judge Fell of Swarthmore Hall, which became the centre of the movement. There the sympathetic and influential judge, although remaining apart from the movement, protected the Quakers from the prevailing hostility against Dissenters. Margaret Fell organized relief funds for persecuted Friends and bound them together through the encouragement of letters. The Society of Friends was born in 1652, although membership was not fixed for some eighty years, and no Quaker has been found to have used the name Society of Friends in print prior to 1793. Their numbers had increased past 40,000 by 1660, and further group action by Friends was needed for many purposes. While breadwinners were off on missions, families had to be provided for. Likewise, sustenance had to be supplied when property became distraint for non-payment of tithes and through other legal exactions. Friends’ marriages without the office of a priest, which was against statute but in accordance with common law, had to be arranged. In 1653 William Dewsbury advised Friends to hold “a general meeting. . . once in two or three weeks, as the Lord makes way, to see that order be kept.” This was what later became the Monthly Meeting. The 1656 advice of a meeting of elders at Balby, with which our discipline still begins (see the Preface of Organization & Procedure), asserted the pre-eminence of “a measure of the light,” which should guide all business transactions. During the last years of Cromwell’s rule, Friends emerged from sparsely populated northern England. They focused on London and other major cities in southern England, but also took their message into Scotland, Ireland and Wales. Quakers travelled abroad on missionary journeys, one such Friend being Mary Fisher, a maidservant, who addressed her ministry to the Sultan of Turkey and his court. Their first gathered following in the Americas was in 1655 among the Puritans of Barbados. From these, and similar gatherings in the north, emerged a constellation of monthly, quarterly and yearly meetings. London became the centre but there was no formal bond between yearly meetings for over two centuries. In general, the need to protect the Society increased the influence of travelling ministers. Friends spoke both with their words and with their lives. To a degree unusual for their times they practised equality of the sexes, equality of status, equality of ages; simplicity of clothing, speech and way of life; peace, in withdrawing from the army and in settling disputes among themselves. Suspected by the Stuarts as subversives, they published their first peace testimony in 1660, at the Restoration. These testimonies, inherited chiefly from the Anabaptist wing of Protestantism, they defended by quoting from the Bible. For this behaviour large numbers were jailed, whipped, branded, fined and deported. Penalties were uneven according to the temper of the judges and the locality, and more severe after the Church of England was re-established under Charles II. England was inching toward toleration and becoming less and less sure of the effectiveness or value of enforcing conformity; and Quaker steadfastness under persecution helped in persuading officials to permit dissenting practices. Contact with Indigenous and African people in America led to the development of the first new testimonies based on the principle of equality. Progress was uneven and slow between 1683 and the 1750s, when John Woolman began his mission to First Nations and more especially to Quaker slave holders and slave traders. With Anthony Benezet and others he aroused Friends’ consciences, until slavery and the slave trade were abolished in the Society. Concerns for racial justice have continued ever since, although broadening awareness of new implications has been painfully slow. A different, conservative, Society of Friends developed in the eighteenth century. Its first leaders had died by 1700 and its members were wearied by proscription and schism. Simplicity and honest dealing had brought them business success. Refusal to take oaths, as implying a double standard of truth, had cost their forebears many a prison term and much loss of property; but since 1696 Whig laws had begun to recognize their affirmations. Like many other Christians they shunned enthusiasm and were little touched by the Great Awakening or the Wesleyan revival. They followed the ways of their forebears, reasoned lethargy into virtue, but yet kept their light shining dimly. In Pennsylvania they withdrew from government in 1756 rather than administer the colony’s contribution to the French and Indian War. They kept more to themselves, bound their group together with rules, customs and much intervisitation, and balanced their birth rate with rigorous disownments. During the imperial wars between France and Britain and in the American Revolution, the peace testimony was repeatedly tested and elaborated. Rhode Island and Massachusetts Friends sought peace during King Phillip’s War and the Dutch wars. Most American Friends sympathised with the colonials’ struggle for the rights of British subjects, but no more than at Charles II’s Restoration did they approve of revolution. They had strong religious, business, and cultural ties with England and were grateful for crown favours. Trying to be neutral, they were suspected by both sides of being spies and favouring the enemy, and were treated roughly. By the opening of the nineteenth century, two divergent tendencies became apparent among American Friends. Both had roots in early Quaker thought, but had subsisted together without seriously disturbing the unity of the Society. One eventually identified with the followers of Elias Hicks (1717-1830), was associated with ideas of political democracy and stressed the Inward Light as the basis of salvation rather than the atonement made by Christ on the cross. Accordingly, when Hicksites referred to Christ as their saviour, they meant the Christ within rather than the Christ of history. The other was a renewed interest in Evangelical Christianity, which centres upon the meaning and influence of events in Christian history and rests heavily on Biblical authority as understood by leading ministers. Both reformist and evangelical trends reflected influences dominant in contemporary Protestant thought. Fortunately in England these tendencies produced only the small Beaconite separation. The tension between the two American Quaker groups, however, grew steadily more severe until in 1827 a separation took place in Philadelphia Yearly Meeting. Similar separations followed in some of the American Meetings, all the groups continuing to claim the title of Religious Society of Friends. Eastern Quakerism, weakened by separation, suffered further losses by emigration through out the nineteenth century. Proportionally large numbers swarmed into the Old North West, Ontario, Iowa, Kansas, Oregon and California. Arthur Garratt Dorland, the historian of the Religious Society of Friends in Canada, has written: “The migration of Friends to Upper Canada was simply the fringe of this great westward movement of which those who came to this Province constituted the merest fragment.” Nevertheless, the establishment of Quaker settlements in Canada was invariably by pioneering emigrants from America but not, as is often assumed, by loyalists in the sense of United Empire Loyalists. The latter were active in their support and allegiance to the King’s party while the former, as was indicated above, must necessarily have been neutral as they remained accredited members of their parent Meetings. While earlier attempts at settlement had been made in New Brunswick, Nova Scotia, Prince Edward Island and at Farnham in Quebec, these were not lasting, but permanent communities were realised at Adolphustown on the Bay of Quinte and at the same time in the Niagara District, so that before the close of the eighteenth century there were organized in Adolphustown and in Pelham, the first Monthly Meetings of the Society of Friends in Canada. These first settlements of Canadian Quakers continued in attachment to the parent New York and Philadelphia Yearly Meetings from whence they had come and, consequently, the separations which affected the Society in America produced similar results among the meetings in Canada, culminating in the great Schism of 1828. One group of Hicksite Friends was first organized as Genesee Yearly Meeting in 1834. It later became affiliated with Friends General Conference, the latter having headquarters in Philadelphia. A second group called Orthodox Friends of Canada Yearly Meeting claimed, as their name implied, to be the continuing body of Friends after the separation of 1828. It was first organized as an independent Yearly Meeting in 1867 by authority of New York Yearly Meeting, of which it was originally a part. It later became affiliated with the Five Years Meeting of Friends (now Friends United Meeting) which has headquarters in Richmond, Indiana. The third group, called The Conservative Friends of Canada Yearly Meeting was organized in 1885 following the so-called Wilburite Separation. This group was associated with similar Conservative Meetings in the United States, of which the principal centre was in Ohio, but was supported by and recognised by a majority of Philadelphia Friends. Terms referring to the three Yearly Meetings in Canada can be confusing but those used hereafter, and which were used consistently through Yearly Meeting minutes prior to union are: Canada Yearly Meeting (Five Years Meeting), Canada Yearly Meeting (Conservative) and Genesee Yearly Meeting (General Conference). Major wars have required Friends everywhere to intensify their search for the spirit of peace in the modern world. Southern Friends were sharply tested by Confederate conscription in the American Civil War. Quaker experience in Union armies was similar though less severe. In the two World Wars larger numbers of Friends have accepted military service, more especially so in the United States than in Canada or Britain, but the Meetings have consistently upheld the traditional testimony of clearness from war preparation and participation. As war has become more comprehensive in its impact on citizens individual testimonies have included tax refusal, non-registration, alternative civilian service and non-combatant military service. Howard Brinton has written that, “Relief work undertaken to repair damages caused by war or conflict is a natural corollary of the peace principle.” To touch briefly on this interesting and important aspect, Friends for 300 Years notes that that relief work outside the Society seems to have first occurred during the Irish War in 1690, when Quakers supplied prisoners of war with food and clothing. In 1755 the Acadians, banished from Canada, were aided by Friends of Philadelphia and, during the Franco-Prussian War of 1870, the red and black Quaker Star was first used as a distinguishing mark. Today it designates Quaker service of all kinds all over the world. In 1914 the substitution of relief work for military service began in England with the Emergency Committee for the Assistance of Germans, Austrians, Hungarians, and Turks in Distress, The War Victims Relief Committee, and the Friends Ambulance Unit which took care of men wounded in battle. This Unit was too closely tied to the war effort to receive the official endorsement of the Society of Friends but the larger part of its members were Friends. These organizations were joined by the Friends Service Council, now incorporated into the Quaker Peace and Service department of London Yearly Meeting. Soon after the United States entered the war in 1917, the American Friends Service Committee was formed to assist conscientious objectors and send relief workers abroad. In 1931, the three Yearly Meetings in Canada decided to appoint representatives to a united Canadian Friends Service Committee. A chain of emergencies has perpetuated some of these institutions until they have become principal agencies uniting all Friends in world-wide work among those suffering in the wake of war. Gradually, however, purely relief functions have been subordinated to the goal of reconciliation. Rufus M. Jones (1863-1948) threw the whole weight of his winning personality into the reconciliation movement within twentieth century society. He interpreted modern trends in Christian thought through his inspirational and philosophical writings. His research on the history of Quakerism connected the Society with its mystical background. Through diplomacy and dedication he was instrumental in the organization of the Five Years Meeting (now Friends United Meeting), the Young Friends movement, and the series of World Conferences held since 1920. Canadian Yearly Meeting participates in these and in Friends General Conference and in the Friends World Committee for Consultation. These broad organizations do not draw every variety of Quaker, but they have extended the bonds of unity. Another result of the conciliatory trend of the twentieth century has been the reunion of branches in the same areas. This movement reached formal completion in New England in 1945, just a century after the separation of the Gurneyites and the Wilburites. New York and Philadelphia re-united soon after and the two Baltimore Yearly Meetings re-united in 1967. In Canada, too, the desire for re-union had been taken to heart by some Canadian Friends prior to 1921 and it grew concurrently with the movement in America. For a number of years prior to 1928, fraternal delegates had been appointed to attend Yearly Meetings of the three branches of the Society of Friends in Canada. In fact, fully a decade before this date, little delegations of Elders from Genesee Yearly Meeting had made exploratory visits to those groups from which they had been cut off. There were some return visits and a real step forward came when Fred Ryon, pastor of Pelham Brick Church Meeting, and his congregation invited Genesee Yearly Meeting to hold sessions in their Meetinghouse in 1921. Business sessions were open to both memberships and Meetings for Worship were shared. The desire for unity was also stimulated in 1928 when Genesee Yearly Meeting (General Conference) and Canada Yearly Meeting (Five Years Meeting) held their annual meeting in joint and concurrent sessions to coincide with a similar joint meeting held at the same time by the two parent branches of the New York Meetings on the one hundredth anniversary of the Great Separation of 1828. Meanwhile other straws in the current gave clear indication of the direction in which Canadian Friends were going. In 1933 a number of Conservative Young Friends attended Camp NeeKauNis for the first time. Begun originally under the auspices of Toronto Monthly Meeting, the camp, beautifully situated on the shores of Georgian Bay, soon became one of the major projects of the Canadian Friends Service Committee. From now on young Friends began to take an increasingly important part in the union movement. Though the decision in favour of organic union had seemed unanimous in 1954, when the Committee brought in its report the following year it met with the first openly expressed objection, principally on the ground that there could be no organic union except on some common doctrinal basis. However, the overwhelming body of opinion favoured implementing the decision of the previous year for a unified organization. The recommendations of the Joint Committee on Closer Affiliation were accordingly accepted, including a new name for the united Yearly Meeting as “The Canadian Yearly Meeting of the Religious Society of Friends.” Pelham Quarterly Meeting, comprising two rural Meetings in which the Evangelical-Revivalist tradition of the 1890s was still strong, decided for the time being to stand aside from the united Yearly Meeting. A fitting climax to the consummation of union in June 1955 was the Meeting for Worship held on First Day morning in the Conservative Friends’ Meetinghouse on Yonge Street near the town of Newmarket. The complexion of Canadian Quakerism has changed since the end of the war from a largely rural aspect to that arising from a concentration in urban areas, where seekers from many walks of life are attracted together. The Society in Canada has also become revitalized by the new vision of many members and attenders from overseas and by a new orientation centred on the advance of Western Canada where the seeds of new Meetings have taken root and flourished. An important difference still exists within the Society in the United States. A large majority of members in Friends United Meeting belong to Meetings that developed a pastoral system of programmed Meetings for Worship as a result of the Great Revival of the late nineteenth century. Their outreach has resulted in strong missionary work among Western Indians, and in Alaska, Latin America, Jamaica, Jordan, and Kenya. There were scarcely more Friends all together in 1700 than in the rapidly growing East Africa Yearly Meeting in 1964. Growth of affection and familiarity among members working on common projects makes it hard to recall today the nineteenth century divisions. The accepted variety of outlook in the Canadian Yearly Meeting is the outward embodiment of inner unity. As Friends draw closer to each other they are drawn closer to God. In 1955, Friends in Canada took the momentous step of becoming a unified Canadian Yearly Meeting born out of the genuine desire to start life together as one family of Friends. They had lived in the tradition of the separations which took place in North American Quakerism from 1826 to 1881. By 1955, separations had been in place for 129 years covering many generations. Working together on a unified Canadian Yearly Meeting Discipline (Organization and Procedure) was the starting point of life together as one spiritual family. (The introduction of revised disciplines from parent Yearly Meetings was one cause of disunity in the past.) However, at the time of union in 1955, it was recognised and recorded that articulation of the Quaker faith amongst Canadian Friends was unresolved and this would be the underlying longing and searching of Friends as they worshipped, witnessed, and worked together in the growing fellowship of the Yearly Meeting. Over more than three decades since unification, the work on revision of Organization and Procedure has continued. As Friends have felt led, each section has been reviewed or revised by the Yearly Meeting Discipline Review Committee, considered by Monthly Meetings and eventually approved by Yearly Meeting in session. Christian Faith and Practice in the Experience of the Society of Friends of London Yearly Meeting continues to be used for religious inspiration and reference. This volume, together with Advices and Queries and Organization and Procedure, constitutes the Discipline (Church Government) of Canadian Yearly Meeting. The growth of fellowship among members of Yearly Meeting in spite of the great geographical distances, in Half-Yearly Meetings, in committees, in local Meetings, in service and witness and the understanding of one another as members of the Religious Society of Friends, has enabled Friends to become a nation-wide Quaker community. This has been strengthened by a number of developments. In 1972, several Meetings in western Canada (also affiliated with Pacific Yearly Meeting) became fully a part of Canadian Yearly Meeting. Individual membership has slowly increased from 603 at the time of union, to 1157 in 1990. A considerable number of Friends are inactive or non-resident. Request for membership by convincement is steady but slow. Approximately one third of the active members serve on Yearly Meeting committees. Most Meetings have a circle of regular attenders. In the smaller Meetings there is often a lack of Friends experienced in the life of the Society of Friends. Approximately 100 members do not live close enough to a Meeting to allow for active participation. They are recorded by Home Mission and Advancement Committee as isolated Friends. In all of the 24 Friends’ Meetings and 25 Worship Groups comprising Canadian Yearly Meeting (1990), worship takes place on the basis of silent, expectant waiting upon God in the traditional Quaker way. State of Society Reports continue to confirm that “in spite of some despondency, Friends in their Meetings are united in cherishing the Meeting for Worship based on silence as the true centre of their life together”. Rural Meetings, especially in Ontario, have continued to decline in recent years, some having been discontinued. New Meetings and Worship Groups have come into being, especially in rapidly growing urban centres across the country, such as Hamilton, Ottawa, Kitchener-Waterloo, and Edmonton. The innovative Prairie Monthly Meeting brings together Friends from outlying places on the Prairies. In Nova Scotia there is a Meeting in Halifax and, most recently, in Wolfville. Older Meetings such as Toronto, Montreal, Vancouver, Victoria and Calgary continue to be active. Argenta Meeting was started by Friends from California in the early 1950s. Twelve Monthly Meetings own their own Meetinghouses, which facilitate continuing opportunities for life together and for outreach. Toronto Meeting (Canada Yearly Meeting [Five Years Meeting]) previously owned a large Meetinghouse on Maitland Street. In 1946, the Meeting moved to the present premises at 60 Lowther Ave, near Bloor St. in downtown Toronto. Today Friends are thankful for the inheritance of Friends House in the large city of Toronto, which provide accommodation for Toronto Monthly Meeting, Canadian Friends Service Committee, the Library, and Day Care Centre. In 1969, a large Meeting Room was added which enables the building to be the hospitable centre for Yearly Meeting committees and a wide variety of community organizations. The availability of rooms for overnight accommodation for visiting Friends is of great service to the Yearly Meeting, whose Office was located in Friends House until it moved to Ottawa in 1989. The historic decision to hold Yearly Meeting outside Ontario, first in western Canada in Saskatoon in 1970, and later in the Maritimes in 1974, alternating with Pickering College, Newmarket (which for many years has been the hospitable home ground for Canadian Yearly Meeting), has made it possible for Friends and attenders from all parts of Canada to become more fully integrated into the Society of Friends. To enable Friends to travel the great distances Yearly Meeting travel budget has been constantly expanded. Funds left in trust by generous Friends in the past supplement the contributions of Meetings and individuals. The Yearly Meeting continues its historic association with the wider Quaker community through affiliation with Friends General Conference and Friends United Meeting, and membership in Friends World Committee for Consultation (Section of the Americas). This participation brings much enrichment of spirit and of life, and often challenges Friends’ understanding of the Quaker faith. The three streams of Quakerism (which united in Canada in 1955) continue in some areas of the United States, whilst in some Yearly Meetings unification took place. In some Yearly Meetings in the United States there are pastoral Meetings and varying theological emphases, and there are also traditional Meetings based on silent worship. Evangelical Friends Alliance (now Evangelical Friends International) was founded in 1965. The appointment of a Yearly Meeting Continuing Meeting of Ministry and Counsel has deepened concern for the spiritual nurture of the Meetings, and for the pastoral care of members. It has also tackled contemporary ethical problems with which Meetings and individuals are faced. Canadian Friends Service Committee is a standing committee of the Yearly Meeting. The Service Committee was established in 1931 and represented the wider organization of Friends in Canada across the divisions. In 1955, it became the service arm of the new Canadian Yearly Meeting. Service projects were already in existence in 1955. The strength and experience which came from participation in Friends’ war time and post-war relief and witness brought fresh impetus to the work of the Committee. Younger Friends and newcomers who had done Quaker service abroad as conscientious objectors in relief and ambulance work, along with Friends from other Yearly Meetings, participated in the work with concern and enthusiasm. The concerns, witness and projects of the Service Committee over the past 59 years have brought much life into the Yearly Meeting, at times with challenges and problems to be resolved. Service projects, peace witness, and education have been supported as Friends have felt guided and have recognized that Quaker concern is “that leading of the Holy Spirit which may not be denied.” The struggle perhaps has been to discern true guidance for projects which express a religiously-based approach to the life of our times and which are not solely philanthropic or humanitarian work. In 1963, the Service Committee took a bold step for the Peace Testimony by accepting the offer of Diana Wright for the use of Grindstone Island on Big Rideau Lake (90 km south of Ottawa) as a Friends Peace Education Centre. Imaginative peace and reconciliation programmes took place there in which Canadian Friends attenders and many others concerned about peace (including a number from the United States) participated. These programmes included training in non-violence, French-English dialogue, Conferences for Diplomats and Quaker-UNESCO Seminars organized by the Canadian Peace Research Institute. The work would hardly have been possible without the service of Murray Thomson as Peace Education Secretary (1962-1969) and other able and concerned Friends who worked on the Island. In 1980, there was a deeply felt need expressed at Yearly Meeting to explore and to renew the spiritual roots of the Quaker Peace Testimony, to deepen our lives as Friends and to be enabled to make a more effective and religiously based peace witness in the world. Two years later, the committee appointed by Yearly Meeting recommended that concerned Friends (Peace Elders) be released to “travel in the ministry under concern for the spiritual and religious roots of the Peace Testimony.” Much dedicated work and travel has been undertaken by these concerned Friends. After a great deal of searching and consideration, the Yearly Meeting laid down the Peace Elders in 1989, affirming the practice of releasing Friends to minister. This retrospect of developments in the life of Friends in Canadian Yearly Meeting since 1955 reminds us of the positive, often very concrete factors which the Yearly Meeting inherited, which were created by the faithfulness of Friends in the past. It also shows us that Friends over the years since 1955 have, with God’s help, become a community of Faith and have themselves continued to build a house of living stones with their own contributions to the glory of God. Friends have continued to work for the Kingdom of God as Jesus commanded, which expresses Friends’ longing for the salvation of the world. They have remained steadfast to this calling since George Fox’s vision on Pendle Hill of “a great people to be gathered.” Over these years, Friends have found guidance through the Presence of God in worship and, in the inward experience of each, shared in the fellowship of the Meeting, thus being empowered by the Spirit of Christ to work for those in need. Becoming a People of God, we work together for the transformation of ourselves, and, through that, of the world. Though the community of Friends in the world today is numerically small, our calling to experience that inward and shared knowledge of God as the redemptive meaning of our individual and corporate existence remains as vital as it has always been.